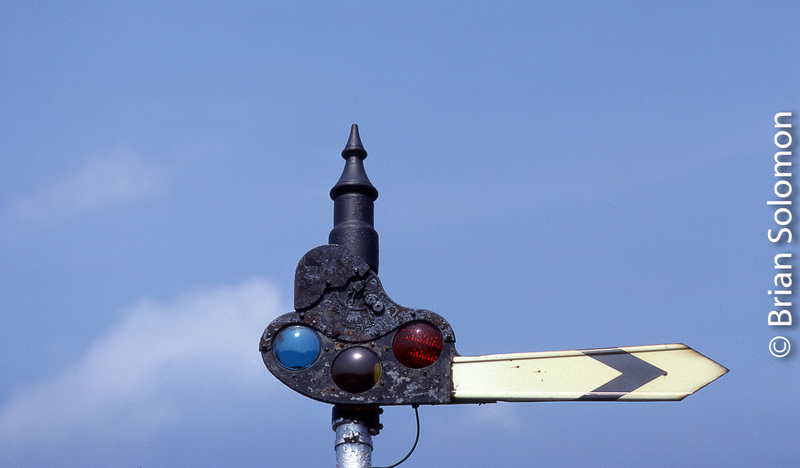 On 4 July 2000, I exposed this colour slide of semaphores at Blackpool North railway station. RPSI Train with Irish Rail 081 at Enfield. It was nearly 20 years ago that I traveled on this Irish Railway Preservation Society special from Connolly Station Dublin to Mullingar. The train paused for a crossing with an up-passenger at Enfield, and I made this view from the main road bridge. It was my first trip to Enfield, and I returned many more times over the years. The signal cabin and mechanical signaling were the big attraction for me. Exposed on Ilford HP5 using a Nikon F2 with 24mm lens. Processed in ID11 and scanned using an Epson V750 flatbed scanner. Style-S Semaphore Where You Wouldn’t Expect to Find One. 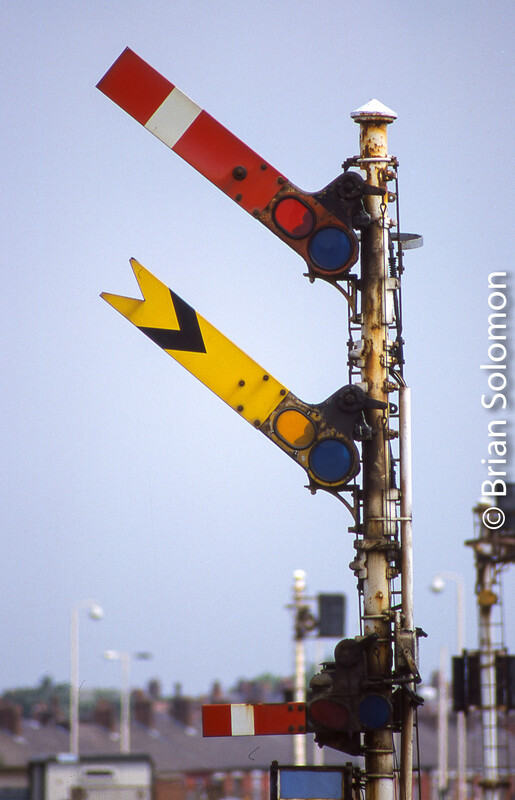 In my books on railroad signaling I’ve chronicled the history of Union Switch & Signal’s Style S semaphores. In the 1980s and 1990s, I made a project of photographing these three-position semaphores on Conrail’s former Erie Railroad route. 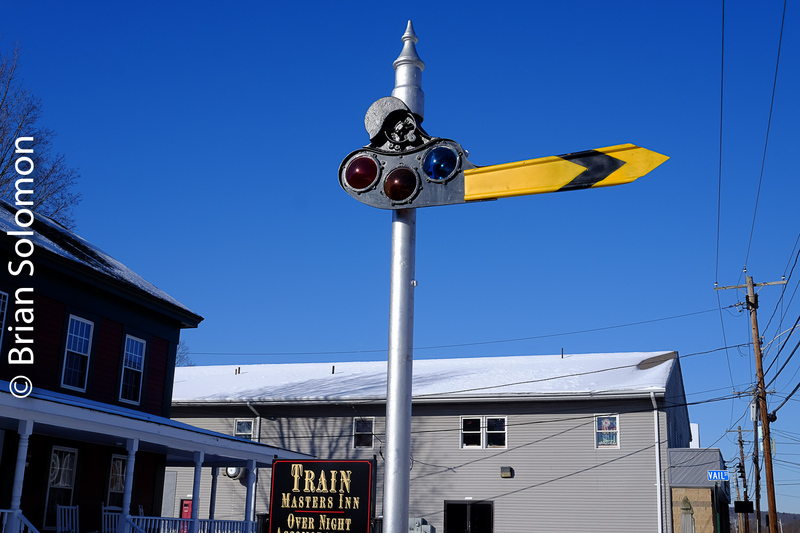 Recently a Style S signal has appeared in Palmer, Massachusetts in front of the railroad-themed ‘Train Masters Inn’. A recent photo of the preserved US&S Style S semaphore in front of the Train Masters Inn on South Main Street in Palmer, Massachusetts. Can you spot the erroneous installation? I asked the owner where he got it, and he indicated from a dealer in Ohio. For point of comparison, I’ve included a few of my photos of semaphores along the old Erie. This was a signal near Erie’s 242 milepost. The style of blade is a bit more modern than the signal in Palmer as it uses a different counterweight arrangement. However careful comparison between this blade and the preserved blade should lead to a conclusion. Certainly, the signal in Palmer has similarities with the Erie’s; same type of blade as used on older installations, same type of finial. Careful observers will notice the operating mistake in the way this preserved signal was installed; something that could be easily rectified. A Susquehanna SD45 roars west at Canaseraga, New York on the old Erie Railroad mainline. Exposed on Kodachrome in May 1988. Conrail’s BUOI is running on track 1 against the current of traffic so the semaphore is displaying ‘stop and proceed’ as this is automatic block signal territory. Believe it or not, this was exposed on May 7th, 1989 following a freak late season snow storm. So I ask, where did this signal come from? Is it from the old Erie? And if so, where .I’d like to know. The Train Masters Inn is a B&B located near the old Palmer Union Station. See: train masters inn. Every so often, I stumble upon something that flummoxes me. On St. Patrick’s Day, I was enjoying the evening’s celebrations with some friends at The Full Shilling in Finglas (in north suburban Dublin). This is a large shop (drinking establishment) with lots of décor characteristic of a Dublin Pub. On the way to the loo, I looked up and was startled to find a three-position upper quadrant semaphore blade. On the surface, it looks a like a standard pattern three-position upper-quadrant semaphore blade, commonly used by many American railways beginning about 1908. The flat-end red blade with white stripe would have been typically used for an absolute signal that display a full stop in its most restrictive position. There’s one critical difference with this semaphore blade; it’s a mirror of the signals typically used in the USA. On most American railways, semaphore blades were oriented to the right, while in British practice (which includes Ireland) they are oriented to the left. (New Haven railroad was an exception). I would guess that this signal is an adaptation of the American pattern for service in Britain or Ireland. But where did come from? And how did this anomalous signal blade find its way to Finglas, which is not even on a railway line. At the moment, this stands as one of signaling’s great unsolved mysteries. Canadian National Caboose passing Monson Semaphore. This old upper quadrant semaphore was located in Monson, Massachusetts about a mile from the Palmer diamond. It served as a fixed distant to the absolute signal protecting the crossing and was always in the diagonal position indicating ‘approach’. 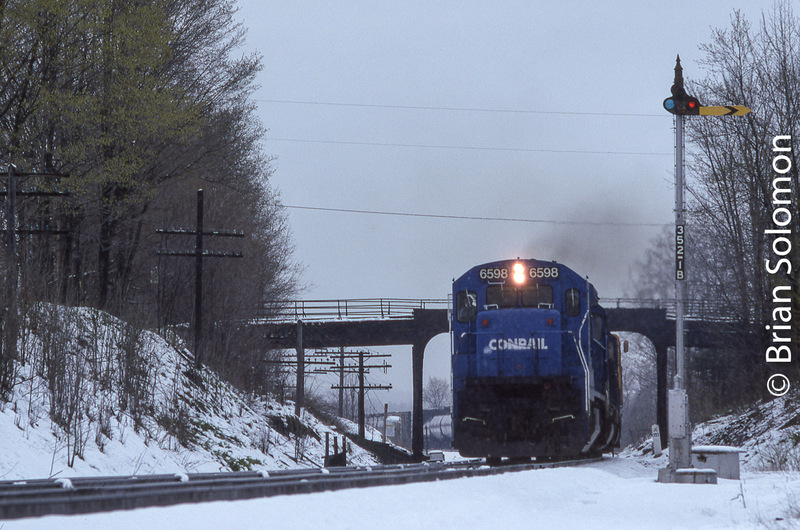 I made this image on July 20, 1986 of a northward Central Vermont freight (probably job 562). Purists may note that Canadian National referred to its cabooses as ‘Vans’. More relevant was that by this date, cabooses were becoming unusual in New England. Conrail began caboose-less operation on through freights a few years earlier. Exposed on July 20, 1986 using a Rolleiflex Model T with ‘Super slide’ insert to make for a roughly 645-size black & white negative. Even rarer in New England were semaphores. Yet this one survived until very recently, when Central Vermont successor New England Central finally replaced it with a color-light. See earlier post: Monson Semaphore Challenge. A minor point regarding this composition; I’d released the shutter a moment too soon, and so the left-hand back of the caboose visually intersects with the semaphore ladder. This annoys me. Sometimes I like a bit of visual tension in an image, but in this case it doesn’t work. Not that I can go back and try it again, as much as I’d like to! Originally Posted September 28, 2012. On Sunday August 22, 2010, fellow photographer Pat Yough and I were making photos in western New York south of Rochester, when we got word of an unusual train on Norfolk Southern’s former Erie Route. Having worked this territory for more than 25 years, I navigated a course cross country to intercept our mystery train south of Silver Springs at Castile, New York. We were both curious to see what this was. As it turned out it was a single SD60M leading a portion of the James E. Strates Show train. We made our photo at Castile near the remains of old Erie Railroad water tower, then chased eastward. We followed it to Swain, Canaseraga, Arkport, and to Hornell, New York, then into the Canisteo River Valley. Among the locations we chose was at West Cameron, New York, a spot on the inside of curve, where in the 1980s I’d often photographed Conrail and Delaware & Hudson trains passing a former Erie Railroad Style-S upper quadrant semaphore (see Curiously Seeking Erie Semaphores posted on September 23). Conrail had single-tracked the old Erie route through the Canisteo Valley in 1993-1994, so it had been a long time since the semaphore came down, yet a portion of the old westward main was retained at West Cameron for use as a setout track, so despite changes, this location didn’t look substantially different to me than it had ‘back in the day’ . In 1988, Conrail SD50 6700 leads eastward BUOI (Buffalo to Oak Island) carrying New York City subway cars rebuilt by Morrison Knudsen at Hornell. 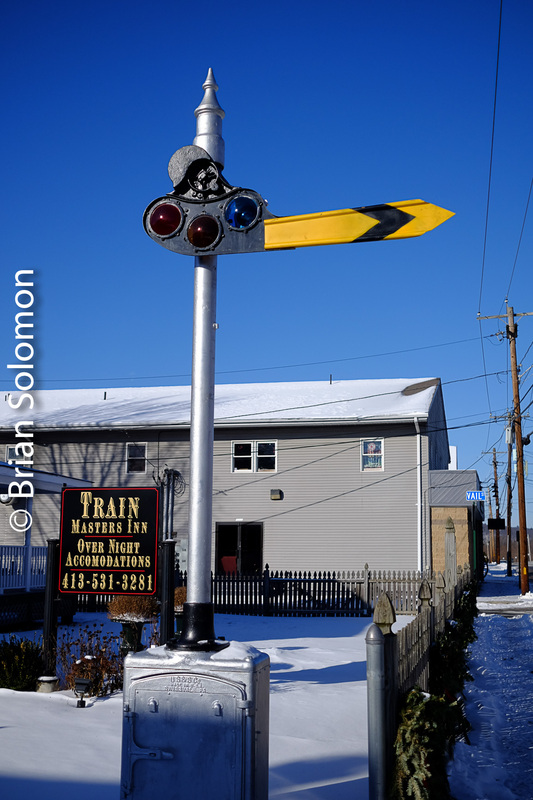 This passes a semaphore on the westward main track at West Cameron, New York. Photo made with a Rollei Model T, a twin-lens reflex featuring a 75mm f3.5 Zeiss Tessar lens. Exposure calculated with a Sekonic Studio Deluxe hand-held light meter. Negative scanned with an Epson V500 scanner. Afterwards, I searched back over my 120-size black & white negatives, and located this view made with my old Rollei model T of Conrail’s BUOI in 1988. Compare these two photographs made at virtually the same location, at approximately the same time of day, yet more than 22 years apart. There are many advantages to working the same territory repeatedly over the years. While familiarity may lead to boredom, it can likewise lead a photographer to make interesting comparisons. A lesson: keep making photographs despite changes that appear to make the railway less interesting. Old General Railway Signal Semaphores In Corn Country. 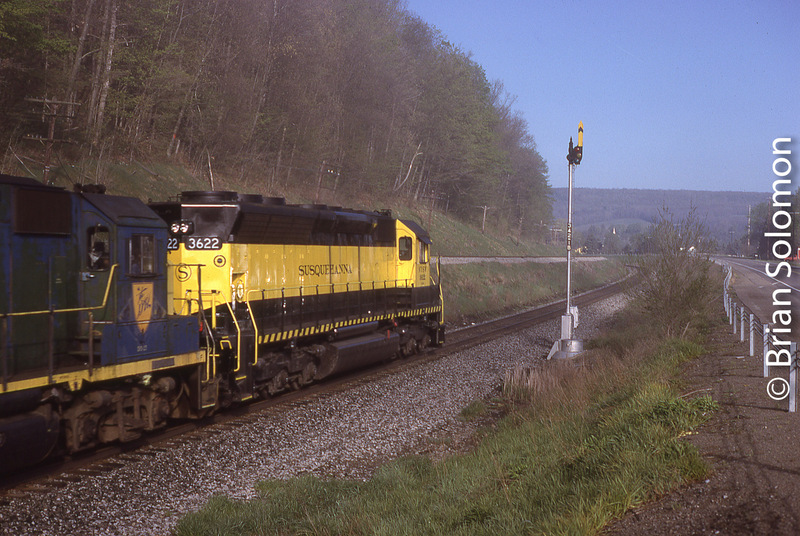 CSX’s former Monon was among the last bastions of semaphores in automatic block territory in the United States. I made this image on the morning of June 24, 2004. While the line only saw a few trains in daylight, there were enough moves to keep the signals busy. Exposed on Fujichrome with a Nikon F3T and Nikkor 180mm lens. The blade on the left displays ‘clear’, while that on the right shows ‘approach’. A northward train was on its way. I wrote about this signal installation in my 2003 book, Railroad Signaling, published by MBI. This has since been reprinted as a softcover book. See: Quayside Press. A horse-drawn wagon crosses the line at Nowa Weis, Poland. The semaphores have ‘x’s’ on them indicating they are out of service. Exposed on 120 black & white film with a Rollei Model T.
One my favorite images from the April 2002 Polish adventure is this timeless scene of three middle-age men on a horse-drawn wagon crossing the line at Nowa Weis. I caught this on film shortly before sunset with my Rollei. It was on PKP’s (Polish National Railways) secondary line that runs southeast from Wolzstyn to Leszno across through unspoiled pastoral countryside. The largely steam operated and under-maintained railway, added to a rural charm that harked back to another generation. For me it was like stepping back a half century, or more. 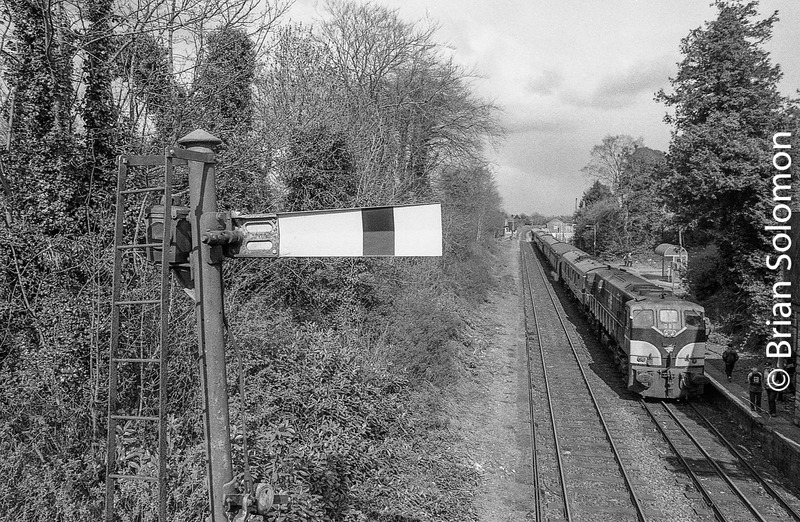 Mechanical lower-quadrant semaphores protected the line at Athenry, County Galway in February 1999. New signaling installed with the Mini CTC program replaced semaphores on the Galway line in Spring 2003. During the past 15 years I’ve witnessed a complete transformation of Irish Railways. Virtually no aspect of the network has been free from change. My fascination upon setting foot in Ireland in 1998 was the extraordinary combination of vintage American-made General Motors diesels, British-style mechanical lower-quadrant signaling, steam-heated carriages, vacuum braked freight trains, not to mention the friendly staff. I owe my ability to have made an extensive documentation of Irish railways to the excellent hospitality and generosity of the Irish Railway Record Society, Railway Preservation Society of Ireland (RPSI), and, of course, the staff at both Irish Rail and NI Railways/Translink. Presently, I’ve been going through the first five years of my 35mm slides for the program I’ll present to the Irish Railway Record Society at its Heuston premises in Dublin at 7:30 pm on November 8, 2012. Titled “Ireland from an American perspective; 1998-2003,” this will feature some of my favourite colour work from an era now ten years gone. In examining hundreds of images, I’m reminded just how much things have changed. Below is just a sampling of the pictures I plan to present; all were exposed on Fuji slide film largely with Nikon 35mm cameras. A signalman works the lever frame at Waterford Central Cabin in June 1998. Now the site of Celtic-Tiger era apartments; in July 2001 this was the busy North Wall freight yards in Dublin. Virtually nothing in this view remains today. An empty passenger train crosses the viaduct at Laytown in August 1998. Irish Rail 182 leads a shale train at Birdhill, County Tipperary on May 28, 2001. An Irish Rail liner approaches Claude Rd, Dublin on a warm evening in May 2000. Former Great Northern Railway (of Ireland) 4-4-0 Slieve Gullion works an RPSI special at Connolly Station, Dublin in May 2001. A short train of empty beet wagons crosses the Taylorstown viaduct on its way to Wellingtonbridge, County Wexford on December 8, 2001. A sunny morning on December 10, 2001 greets Irish Rail 166 with a bag cement train at Thurles, County Tipperary. An RPSI Strawberry Fair Special on the Dublin & South Eastern route near Rathdrum in July 2001. Irish Rail145 leads a loaded welded rail train at Kildare in August 2002.